All you can read is about 10 or so lines, according to Tokyo Shinbun citing Kyodo News (9/7/2011). TEPCO submitted the 12-page document as requested by a Lower House committee concerning the emergency operation procedure at Fukushima I Nuclear Power Plant. Following the “request” (it was a formal request) from the Nuclear and Industrial Safety Agency to pay close attention to the PP (Physical Protection), TEPCO blacked out almost all of the information, resulting in the document as you see in the picture. 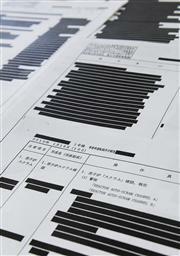 According to TEPCO’s Matsumoto, it was part of the document that was blacked. I suppose 99% is still considered “part“. Needless to say, the committee chairman is not very happy, and requested that TEPCO re-submit the document. The committee requested the information on emergency procedure from TEPCO, as the allegation that manually stopping the IC (emergency cooling system) may have caused the meltdown in Reactor 1, blaming the worker. You can view the TBS news and see the completeness of the blackout by TEPCO.